1 cup is 2 Weight Watcher points but you don’t need to be watching your calories to appreciate a yummy bowl…or two! I’m a soup girl. I could devote an entire blog to my soup creations. I could eat a bowl of any soup any time of day. There is something comforting to me while I have a large pot steaming away all day while I go about other chores, visiting the pot to add an ingredient, give it a stir or to simply taste its progress. Though a mystery to my Mom, as I was not a fan as a child. I would turn my nose up to anything considered a soup or stew opting for a PB&J instead. I’d pout, make terrible faces and whine until she would cave and excuse me from my bowl. Despite that I deserve paybacks from my own children, to my pleasure, they too, share my (Now as an adult) love for bowls of anything soupy. 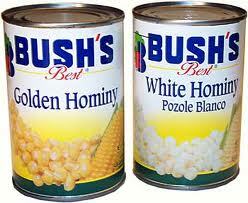 First, before I continue onto my recipe, let’s get a little lesson on Hominy. 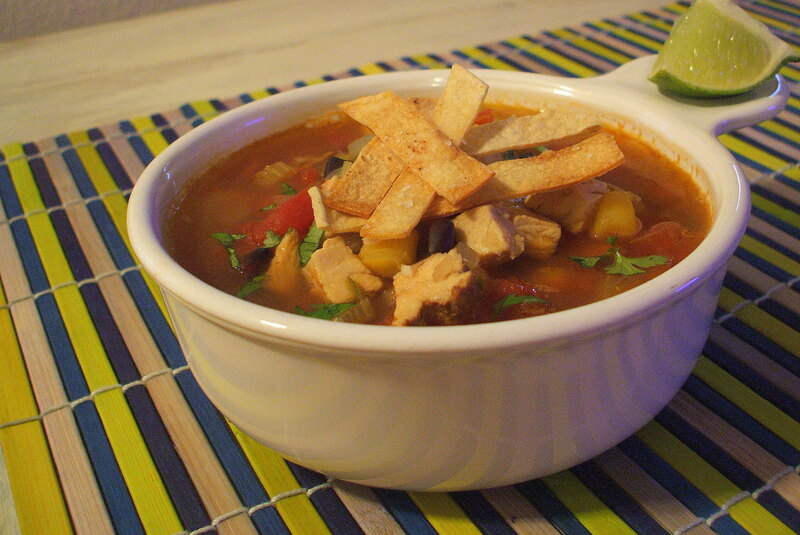 These corny nuggets are what really make this the BEST Tortilla Soup ever! Why Hello, Hominy, welcome to my kitchen. According to Wikipedia, Hominy consists of dried maize kernels which have been treated with an alkali in a process called nixtamalization….okay, lesson over…just know this stuff is really cool…indians used it too…so it must be magic! In a large stockpot sweat your onions and celery in a bit of EVOO for a couple of minutes. Add garlic and chopped corn tortillas. Sweat for another couple of minutes. Add spices, tomato paste, broth, tomatoes, beans, chilis and bring to a slow bubble. Turn back heat and let simmer for about 15 minutes. 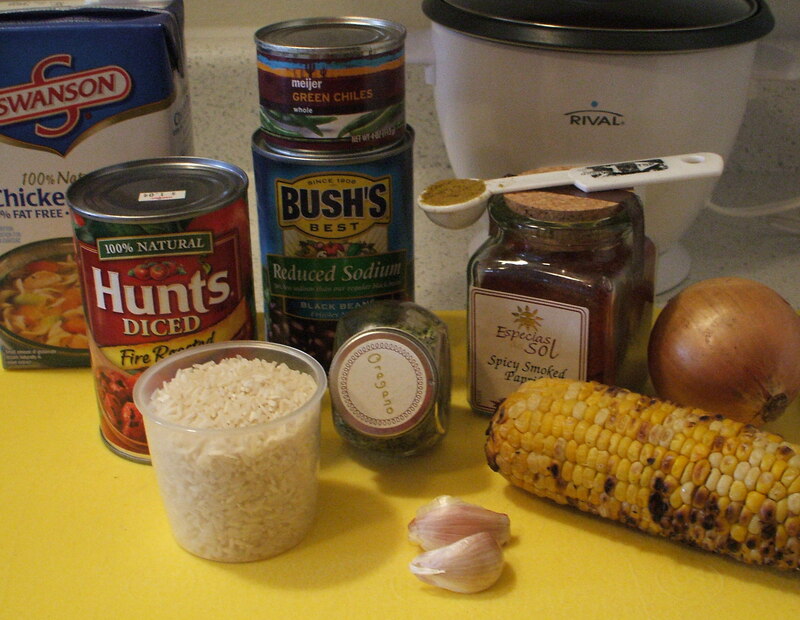 Add hominy, and chicken. Simmer for another 10 minutes taste and adjust seasonings. I believe I ended up adding more chili powder and cumin. Just before serving, add the zest 1/2 lime into soup and juice of whole lime. Simply cut 2 corn tortillas into strips, spray sheet pan with cooking spray, lightly spray tops of tortillas and sprinkle with sea salt. Bake at 350 degrees until edges begin turning golden, about 10 minutes or less. 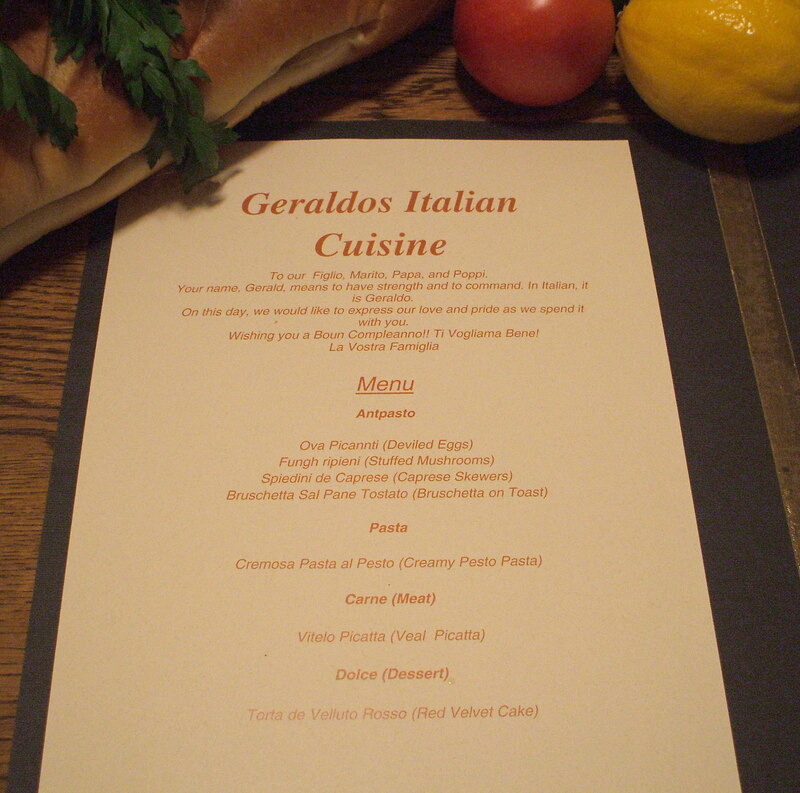 I even made menu’s for the Birthday Party, Using my Dads name, Jerry, in Italian to create his own restaurant. No, we are not Italian, but my Dad’s favorite place to eat is Olive Garden, so I wanted to create his own Italian restaurant for his birthday, complete with Menus. These were fun to make and each guest had one. Since I, of course, do not know a lick of Italian I found this groovy site on the internet that helped me change my English words to the language of love. I bet she couldn’t hold back the tears when she opened up this very thoughtful gift from her son on that Christmas morning. 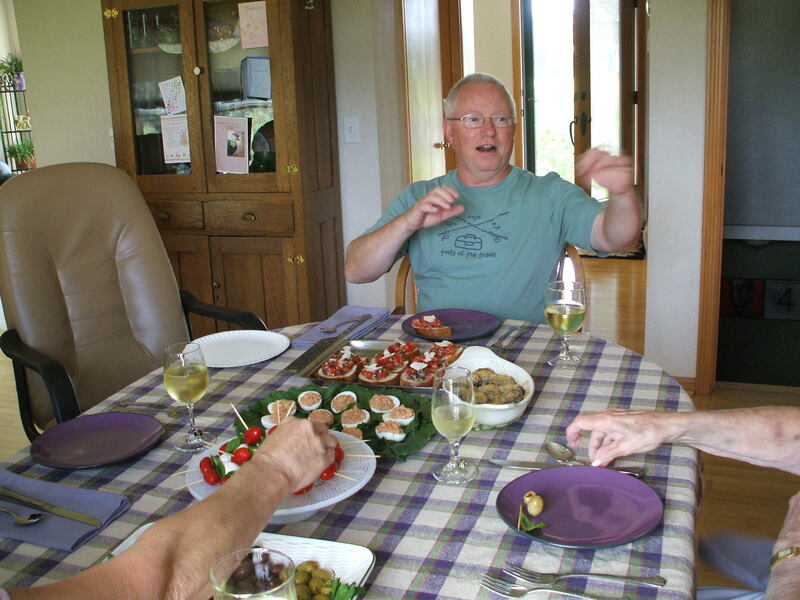 I imagine that the whole family gathered that year and enjoyed a lovely dinner prepared by Mom. 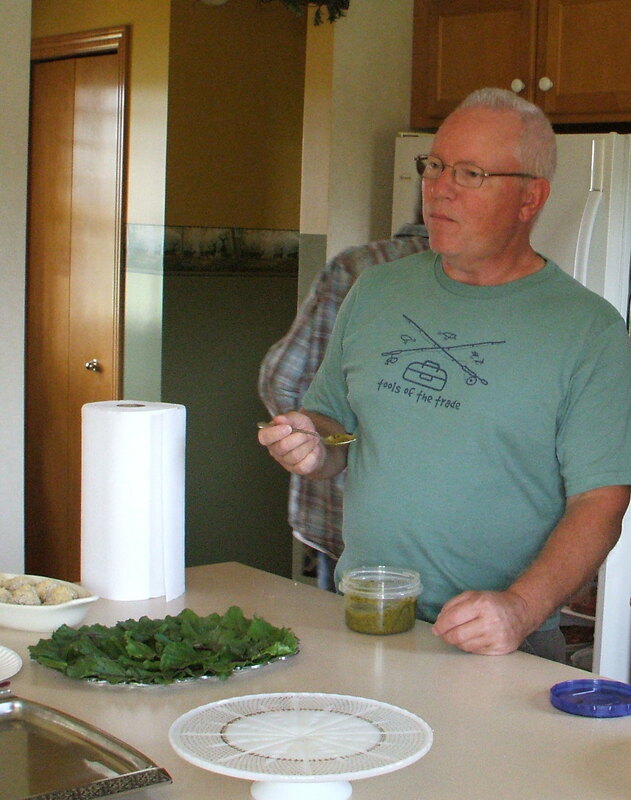 In the same spirit, I wanted to make a meal that would let my Dad know just how much he is loved by his family. I even talked my teen into playing the very important role of our Waiter. 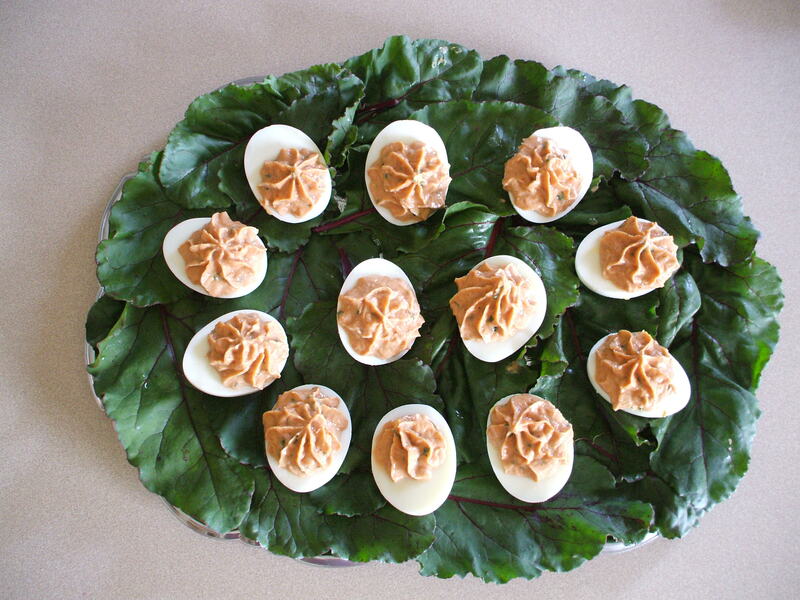 An Italian Deviled egg recipe from the Pudgy Mom’s cookbook that included anchovy and cocktail sauce. I found that a lot of the authentic recipes included anchovy’s. 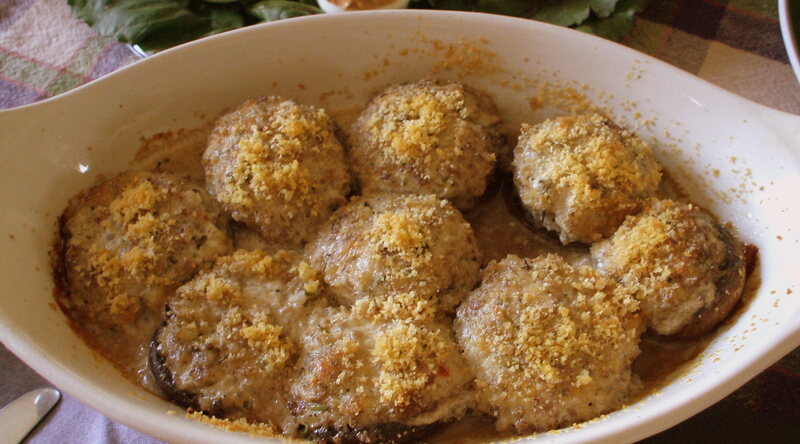 I couldn’t forget the stuffed mushrooms at Dad’s party as these are a favorite of his. Good thing I had a whole other 9X13 pan because these buggers disappeared fast! How lovely it all looked on the table. I must say, I was pretty proud of myself! We could have stopped there, but I had a main course planned. 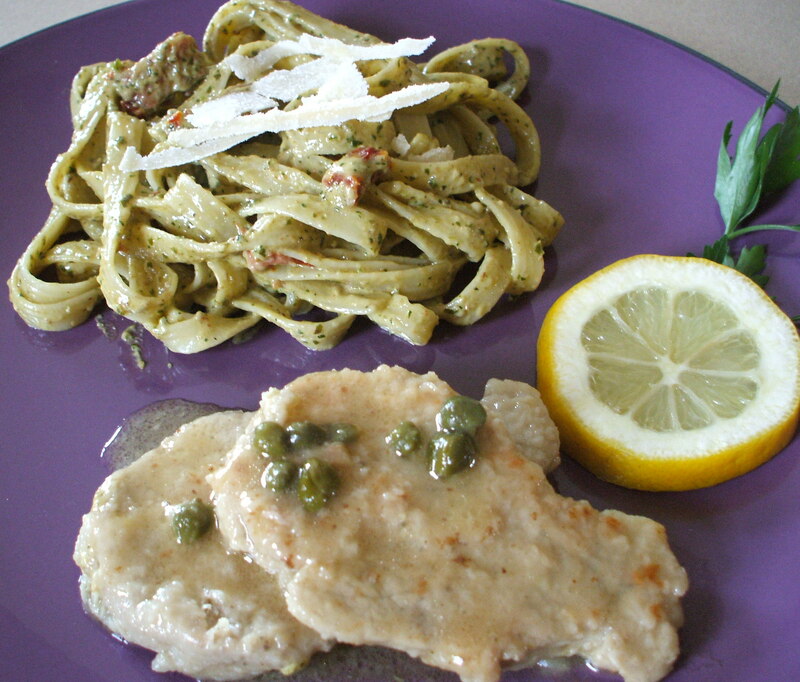 Veal Picatta. I’ve never even eaten this dish before, but when I read the recipe I knew It had to make an appearance at our event. It was served with a side of my Creamy Pesto Pasta recipe. I even made the Pesto! I had assumed that I would be able to find veal at my local grocery store…NOT! I have to order it from a meat market…$60.00 later, we would all have a 40z serving. I’d never made it before and the pressure of making sure I didn’t make a mistake at that price almost broke me, but I stayed focused and this was the final result. Everyone seemed to enjoy this dish, but to be honest, I’m pretty sure I used too much lemon and chicken could have easily replaced the veal for a less expensive and just as tasty dish. My lovely family, though, only offered compliments. Whew, success! We all had a great time and I know that this is an Italian Birthday that my Dad will remember for years to come. After all the clean up was done, I had to give props to my little guy as he was so good and stayed out of mommy’s way while I was busy in the kitchen. Pumpkin Cinnamon Rolls with Maple Cream Cheese Icing. Fall is here and so is the canned pumpkin. My grocery store had it on sale for only a dollar, so the thrifty shopper I am, stocked up! As I stacked the cans in my pantry I delightfully pondered the recipe possibilities. There were the obvious options of pumpkin pie, pumpkin cheesecake, muffins and bread, but then it occurred to me! 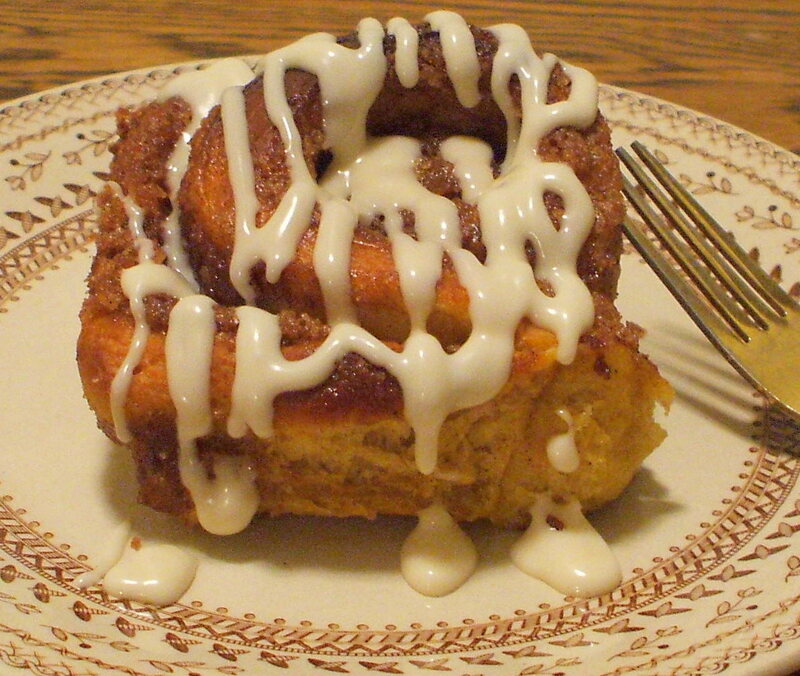 Why not pumpkin cinnamon rolls! The project began. 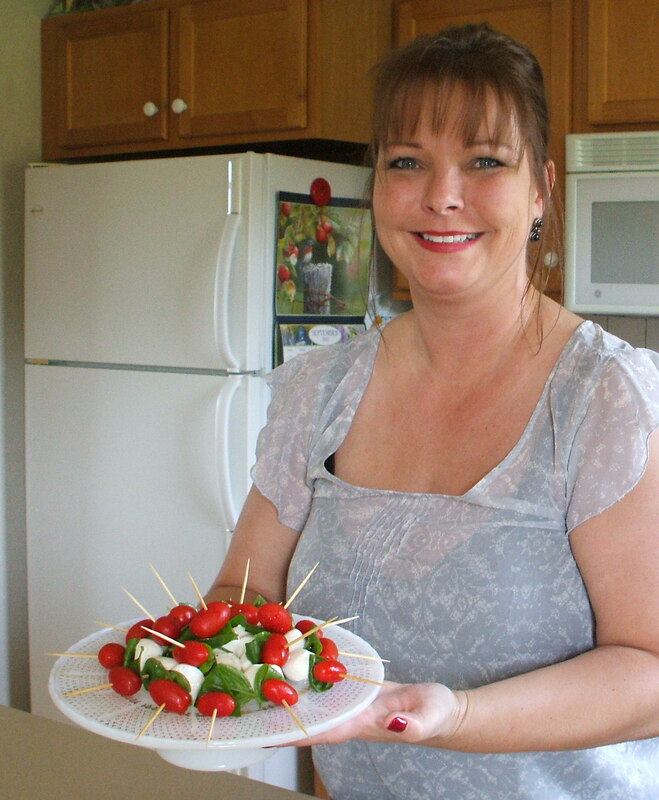 I went to my trusty internet and found that other home cooks have shared my thoughts. So began the exciting process of my first cinnamon rolls from scratch and Pumpkin would be the star! Remember that bread machine long forgotten in the back of the cupboard? Get it out, as it’s going to be your best friend. You are going to use the dough setting to make this recipe so much easier! Set bread machine to dough cycle, and dump the above ingredients in machine, start and forget about it! The dough cycle will mix, knead, and bring you through the first rise. Meanwhile, begin making the filling and icing. Mix all ingredients together until well blended, set aside. 6 oz cream cheese at room temp. In a medium bowl, mix with electric mixer all ingredients until well blended. Transfer icing to a large ziploc plastic bag (1 gallon size) seal and chill. When dough cycle is finished, remove dough from bread machine onto a floured surface. With a rolling pin, roll into a rectangle about 9X12. Spread filling mixture over dough (I found that using my hands worked the best) Roll dough from the long side into a log. With a sharp knife, cut into 12 1-inch slices placing into a greased 9×12 baking dish. Cover and let rise again for about 45 min to an hour. Bake in a 375 degree over for about 20 minutes or until golden brown. Remove from oven, let cool slightly. Cut a small hole in the bottom corner of the icing bag and drizzle over the warm rolls. Enjoy your Ooooeeey-Goooeeey creation warm with your favorite loved ones! Recently, I added a rice cooker to my collection of useful kitchen appliances. I didn’t spend much, in fact, this little guy was under $20.00. Not sure if It would end up in the appliance graveyard or a much appreciated purchase, I was reluctant to leave us eating hotdogs and pasta for the week so, I bought the second cheapest model. To my great surprise, I am in love with my rice cooker! 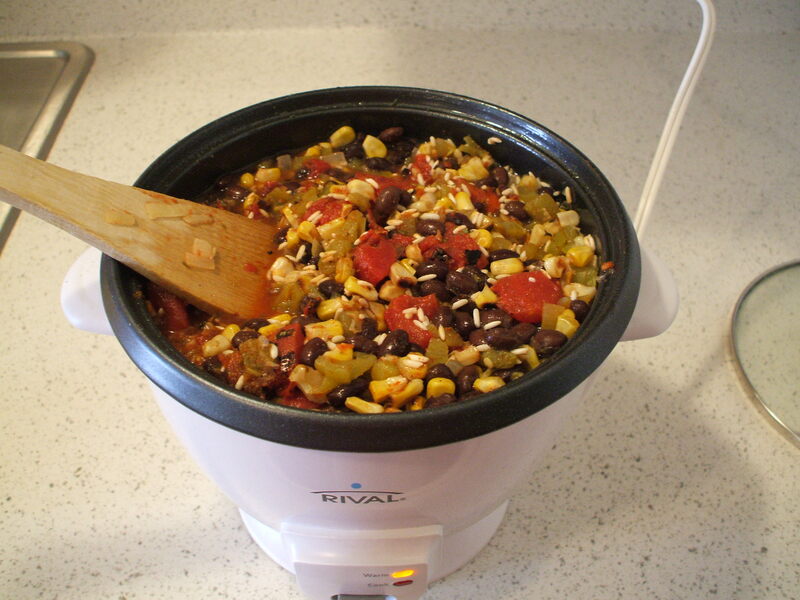 Like a crock pot, this is a busy mom’s dream! Fill it and forget about it. Perfect rice in about 30 minutes. Unfortunately, I have not found many rice cooker recipes that impress me. So, today, after spending too much time browsing the internet for a tasty Mexican Rice recipe to serve for a Fiesta night, I made my own. Slice a lime and crack open a Corona, this recipe deserves a toast! Note: Recipes Yields about 6 cups cooked. 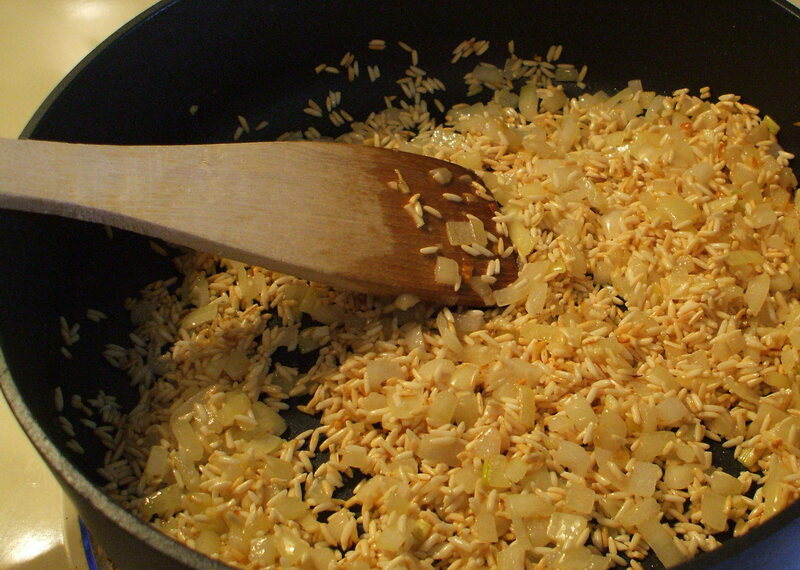 In a frying pan, brown rice in EVOO to make it toasty. 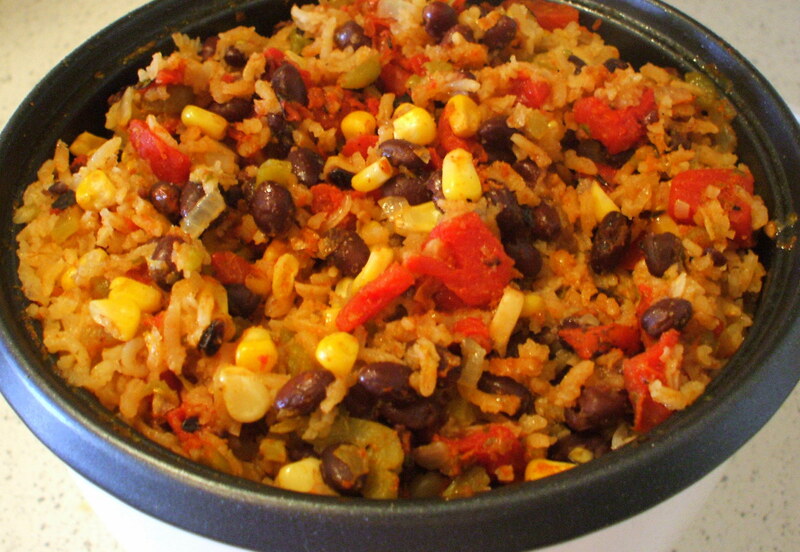 This is what adds the nutty flavor to traditional Mexican rice. Add onions and garlic, stirring often until onions are beginning to turn translucent. Lightly spray inner part of rice cooker with cooking spray and add rice/onion mixture. Combine remaining ingredients, set cooker to cook. Add all ingredients into Rice Cooker....Whoa, careful, this baby sure is full! When cooker turns to warm setting, give a stir and return cover. Let stand for another 10 minutes. Serve with fresh cilantro and sour cream or shredded cheese if desired. Or “Ahhh Juice” as my 5-year old calls it, after he slurps the remaining jus from the little bowl. 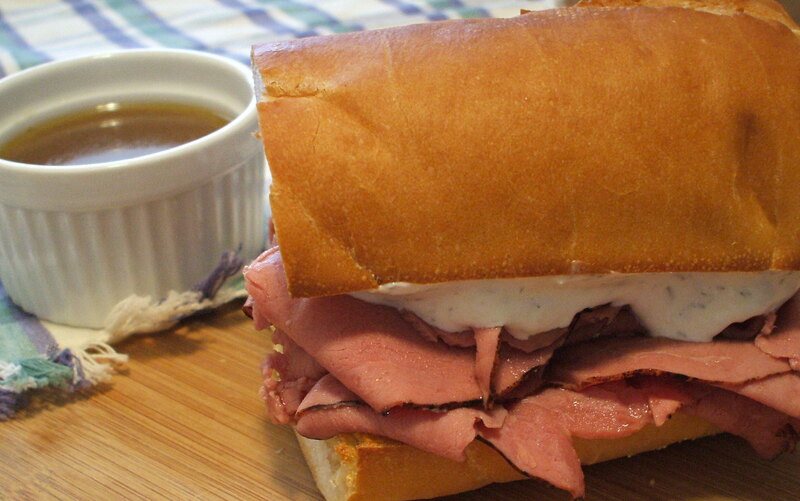 Any time I find roast beef on sale at my deli, and sometimes even when it is not, I make these toasty sandwiches, topped with swiss cheese and a creamy horseradish Dill sauce. Served with a side of flavorful Au Jus for dunking, it’s sandwich utopia! This can be made ahead of time, and should be chilled at least 30 minutes to allow the flavors to marry. Combine all ingredients in a bowl, cover and chill until ready to serve. In a medium sauce pan, heat about 1 TBS EVOO and 1 tsp butter. Add Shallot, and allow to begin to soften stirring often, about 3 minutes. Add garlic, careful not to burn for about a minute. Sprinkle flour into onion garlic mixture and cook for about another minute. Add a healthy splash of red wine and let cook down until it begins to reduce. Slowly add beef broth, bring to a simmer for about 15 minutes. Meanwhile prepare French Dips. 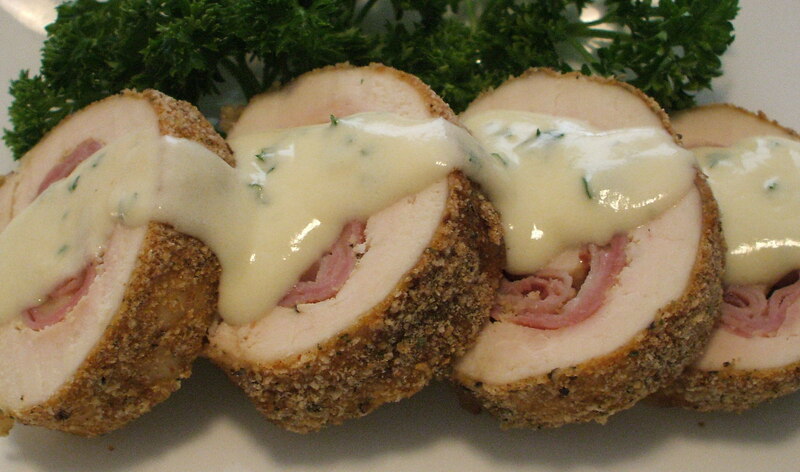 Chicken Cordon Bleu – Ohh la la! Between 2 pieces of plastic wrap, pound chicken to about 1/4 inch flat, careful not to tear. Salt and pepper both sides, brush the inside of the chicken (the side that doesn’t look as pretty) with Dijon mustard, place slice of ham and cheese on chicken and begin to roll. Secure with toothpicks. Dip in egg wash and coat with bread crumbs. Place rolled chicken onto baking sheet or 9×13 pan sprayed with cooking spray. At this time, you can immediately bake or store in the refrigerator up to 24 hours. Bake in 350 degree oven for about 50 minutes or until a meat thermometer reads 165 degrees. Remove from oven, tent with foil and let rest before slicing. Heat pan and melt butter, add wine and bouillon powder bring to a boil reduce by 1/3. Slowly add cream and cornstarch, stirring constantly until sauce thickens. Add fresh chopped herbs. Pour over sliced Chicken Cordon bleu. Sauce is also wonderful over steam vegetables such as asparagus or broccoli. 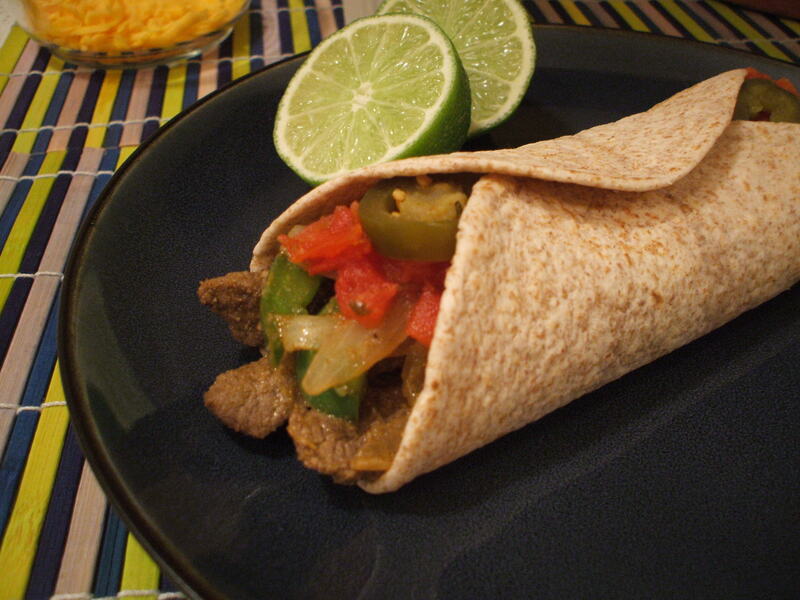 Steak Fajitas fit for a Fiesta! Need a little Fiesta in your life, but don’t want the sombrero around your waist? You’ve found the right place! This recipe has all of the party favors, but didn’t invite the unwanted fat. 1 1/2 lb lean beef trimmed of any visible fat and sliced thin with a sharp knife. I used 2 top round steaks. Combine marinade, pour over sliced beef in a large plastic bag and let marinate at least 1 hour. Be sure to remove bag of marinated meat to counter at least 20 minutes before cooking to take the chill off. In a large, heavy non-stick frying pan, spray with cooking spray and saute peppers and onion until just beginning to soften. Remove from pan. Spray pan again and add beef cooking at high temperature just until no longer pink, add peppers and onions just until warm. Scoop 1/2 cup mixture into warmed tortillas, top with desired ingredients and serve with your favorite Margarita! Dress with additional lime and cilantro. It’s Fiesta time! The New Year is well on its way and many of us are paying attention to our diets after indulging in so many holiday goodies. This Italian Minestrone Soup recipe is so hearty and satisfying, you don’t even realize you are eating a big bowl of Healthy Goodness! A generous 2-cups of steamy heaven is only 188 calories, 1.7grams of fat, and packs in 9.7 grams of protein and 9.4 grams fiber…. But how does it taste you ask? It’s an Italian festival in your mouth! 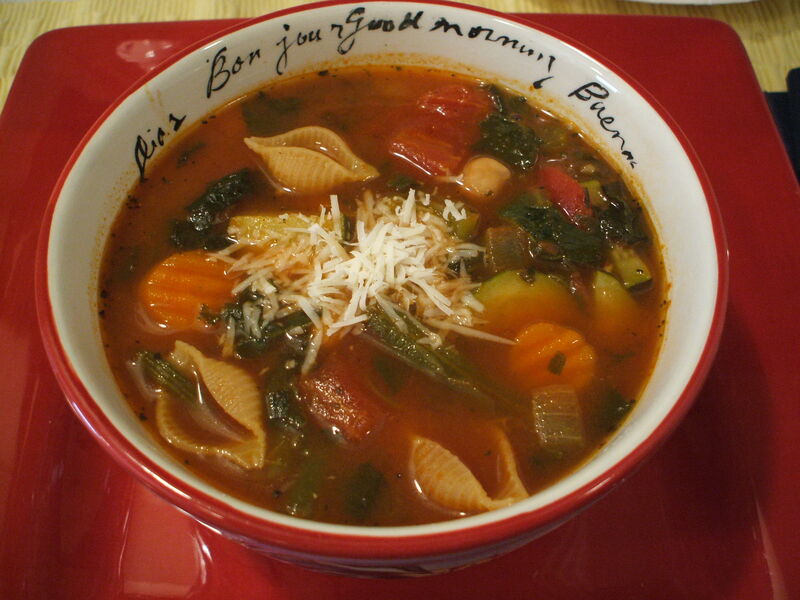 Tomato, garlic, Italian seasoning, hearty whole grain pasta and savory vegetables satisfy all of your cravings. With these numbers, one can even afford to grate some quality parmesan cheese over the top! 2 cups loose leaf frozen spinach. The 10-oz frozen block may be used but it will need to be defrosted and drained of juices. Sea Salt to taste if desired. Spray cooking spray on the bottom of stock pot. Preheat on med-high heat, add onions and celery. Let them sweat, turn down heat if needed to prevent browning, about 3 minutes, add frozen sliced carrots (or fresh). Stirring often, allow vegetables to become slightly tender. Add garlic, cook for 1-2 minutes more. Add tomatoes, juice and all, chick peas, broth, tomato paste and italian seasoning. Stir and bring to a gentle boil for 15-20 minutes. Meanwhile, clean and slice zucchini. Add zucchini, green beans (no need to defrost), spinach and pasta. Soup is done when pasta is done. 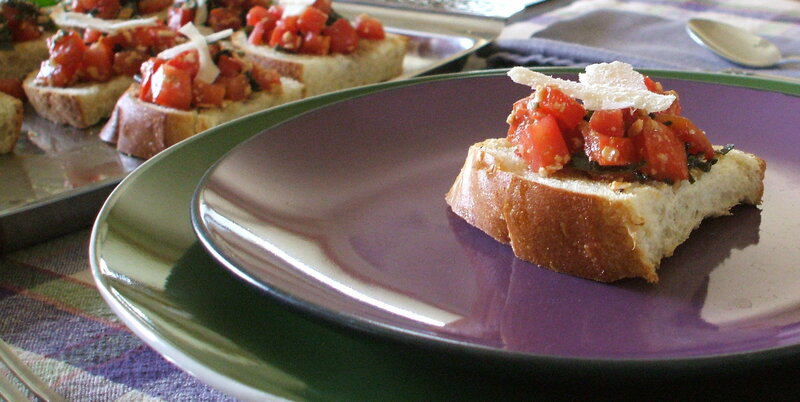 Serve with grated parmesan cheese and crusty bread if desired. Ham, sharp cheddar cheese, spicy brown mustard and refrigerated biscuits are a tasty dinner sure to please the family and help you use up the leftovers. As the holidays have come to an end, I find that there are many tasty ingredients in my refrigerator worthy of being showcased. With a bit of help from store-bought biscuits, an impressive and easy meal was made. Once you’ve tried these, the filling options are endless! I simply served these pockets with a side salad for a complete and nutritious meal. Preheat oven to 350 degrees. In a small bowl, make your egg wash by whisking 1 egg and a splash of water to thin, set aside. Lightly flour surface. Roll a refrigerated biscuit to a 6 inch circle. Smear a thin layer of mustard in the center. Place 1/4 cup diced ham and 1 oz cheese just off from the center. Dampen bottom edge of biscuit with either water or I used the egg wash as it was next to me. Fold in half gently so not to tear dough. Gently seal with a fork. With a sharp knife, make 2-3 slits in the top. Lightly brush with egg wash and sprinkle with sesame seeds. Bake for 15-17 minutes or until the dough is a golden brown. Let cool slightly and serve. These are so easy and will disappear just as quickly as they were made. 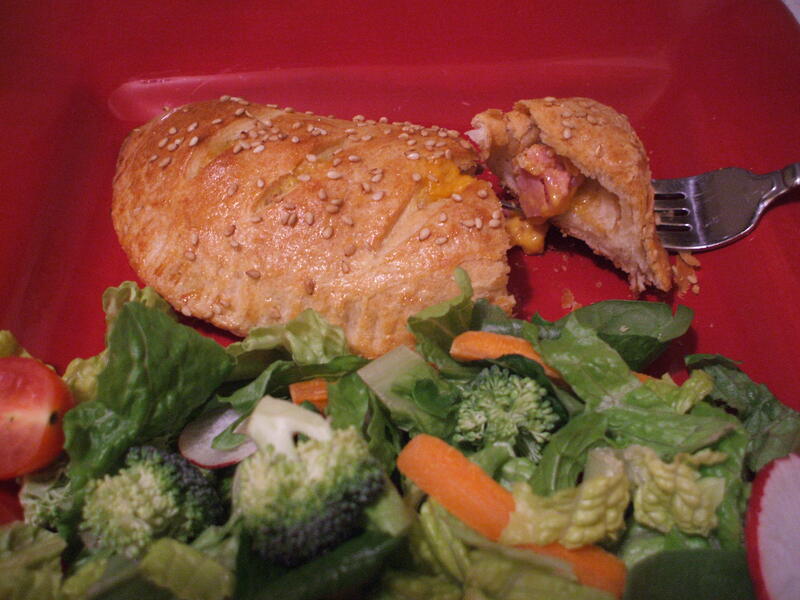 I did, make a few with ham, diced green apples, cheese and Dijon mustard. These were the kids favorite! Other ideas for filling would be pizza sauce, fixings and mozzarella cheese. Or, as a friend of mine suggested, use pie filling, and sprinkle the top with cinnamon and sugar for dessert.